Throughout the twentieth century, Richmonders have used the spaces of 17th Street as a place of economical and social prosperity. The street was the site of one of the Richmond’s oldest landmarks and first public markets, giving it the name “The First Market Square”. As time passed through the 18th, 19th, and into the 20th century the corners of 17th Street would always be marked as a place where not only residence and business owners in the area, but people from all around the city, could come together to socialize and buy and sell goods. Vendors came from everywhere on wagons, cars, trains, and by foot to sell the freshest produce. 17th Street was a thriving hub of commerce, trade, racism, and renovation. 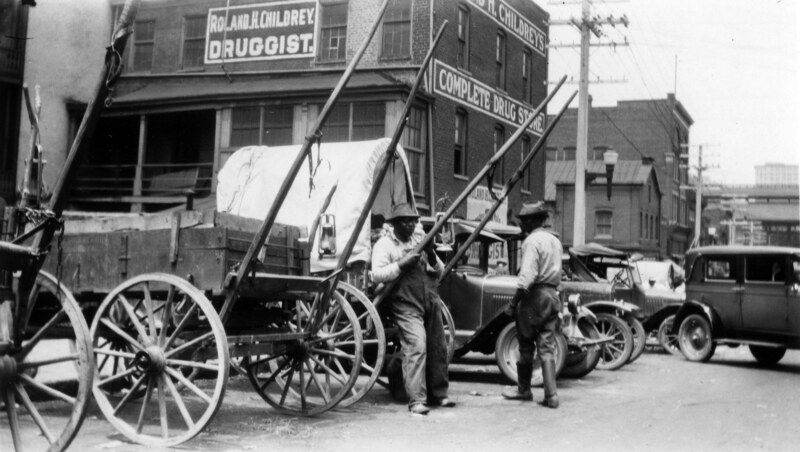 As the street prospered through the 1800s, it reached heights of economic growth through the trading of slaves. This was only to suddenly meet a complete demise in the mid 1900’s. The spaces of 17th Street proved that the people of Richmond honestly care about their cities history, as in the late 20th century the city Council Committee came together to embark on a restoration project of the 17th Street farmer’s market. Before anyone can truly grasp why the people of Richmond would save such an old and dilapidated landmark, one must look to the past to explain the future. The 17th Street market was placed perfectly at the intersection of one of the busiest roads between Richmond and Williamsburg. Main Street brought travelers from all over, bringing them through the heart of the city and then directly to the main Market Square of 17th Street. The market was also placed in the ideal spot along the James River and Shockoe Creek, bringing large and small boats filled with fresh goods and shellfish right up to the market. The ideal location of the 17th Street farmers market allowed for the prosperity that the market would receive throughout the 18th and 19th century. 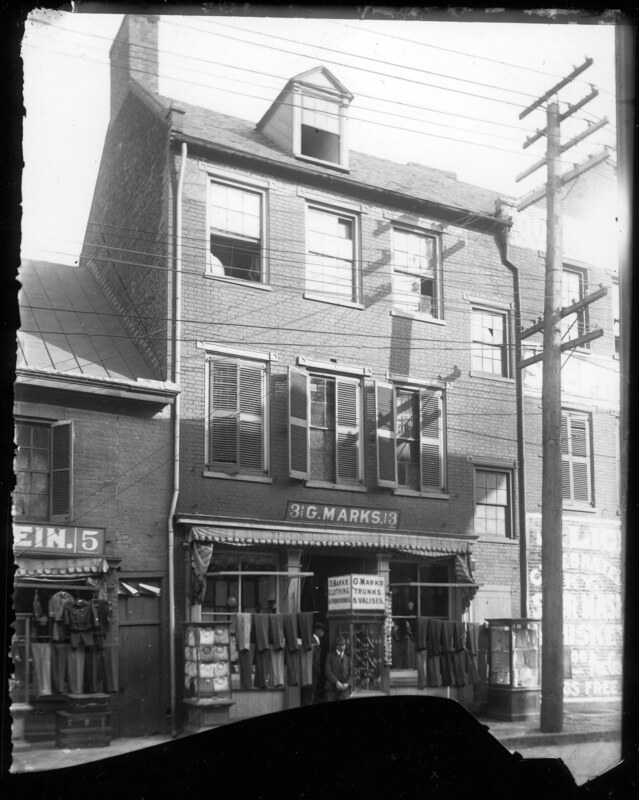 When looking at a photograph from the early 1900’s displayed in the Cook Collection in the Valentine Museum in downtown Richmond, the particular location of the 17th Street Market and the shops around the market brought a great amount of economic growth to shops such as G. Marks, which is a clothing store near the 17th Street Market. As the sign on the front of G. Mark’s store says “trunks & valises,” the luxurious items being sold also reveals that the 17th Street Market doesn’t only draw a crowd of people looking to buy the freshest goods at the cheapest bargained prices, but also attracts rich businessmen in need of many expensive imported shirts, vests, hats, “trunks” and “valises”(which were French overnight bags). The culture of the 17th Street Market and the shops that surround it appeared to be one in which the rich white person in search of expensive clothing and supplies can shop along side a poor black person hoping to by food and necessities to survive the week. While 17th Street proceeded through the mid-1800s and into the early 1900s the farmer’s market it continued to economically and socially grow. Shops around the farmers market remained prospering, for the most part, and people came from all over the city to shop. The interesting aspect to 17th Street in the beginning of the 20th century was mixed races often walked side by side on the streets and shopped together in stores, like Roland H. Childrey’s Drug Store. As seen in a picture, from the Richmond Valentine Museum taken around the 1920’s near the 17th Street farmer’s market building, white folks in fancy automobiles are parked next to black people who still have wagons. While, segregation and discrimination do exist in society during the beginning of the 1900’s, 17th Street was neither a place that only white people could walk down nor could solely black people walk down it. The 17th Street farmers market presented a place in which blacks and whites were forced to walk side by side and shop on the same street for necessary supplies and goods. As the 17th Street Farmer’s Market continued to prosper and undergo renovations through the early 1900s it’s growth came to an abrupt stop as it reached the half waypoint of the century. It was at this time that Shockoe Bottom had begun to have a serious decline in economic and social prosperity. The struggles of the market and Shockoe Bottom came from the idea of the people, that “bigger is better.” Civilians no longer needed to travel to small market stores on 17th Street to fulfill their needs. Large grocery stores began to sprout up all around the city and factories were pushing out the minuscule family farmers by bribing them with regular paychecks. Then to make matters worse, in 1961, The First Market House was razed, which reduced the 17th Street Farmer’s Market to a cluster of scattered vendor stalls. The Council Committee on Public Buildings stated that, “One of Richmond’s oldest landmarks, the First Market in Seventieth Street was pictured as a disgrace and discredit to the city.” A butcher by the name of Benjamin Jacobs claimed that the end of the market where the “slops” or waste was stored looked more like a slaughterhouse than an actual market. Jacobs also claimed to have seen rats scampering all over the place. It was in the mid 1900s that it appeared that the market would attain a total demise. The Council Committee on Public Buildings met together in 1942 to propose a future plan to revive the “old” market. While at first the committee took some time to approve the money and plans for the revival of the market, the Council Committee was finally able to agree on their agenda. 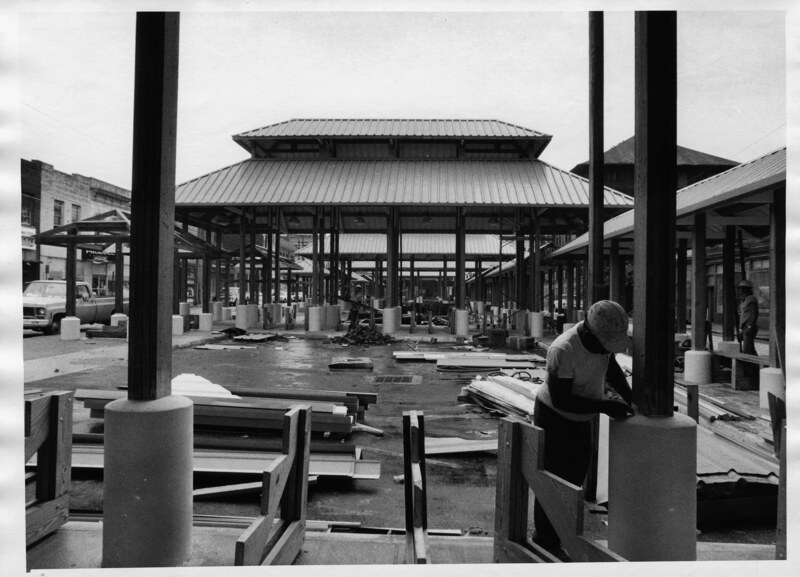 One councilman by the name of Cecil Harris, made a firsthand inspection of the conditions of the market and came up with the idea to tear down the “old” farmers market and put an open-air structure in the late 70s into the early 80s. The new structure would help with free up traffic on Franklin Street, which was already packed with steadily moving cars. This period of time began with the renovation of the construction of the 17th Street Farmer’s Market. The construction of the new open-aired structure can be seen in a picture, from the Richmond Valentine Museum, showing the construction of the building. This revival of the 17th Street Market, funded and executed by the Council Committee on Public Buildings, proved to alter the previously dismal future for one of Richmond’s oldest landmarks and brought some life back to Richmond first public market. Richmond Daily Dispatch. “Council Group Ask Repairs For Market.” January 22, 1942. Jones, Mayor Dwight C. “Farmers’ Market-History.” Accessed April 30, 2011. http://www.richmondgov.com/FarmersMarket/History.aspx. Richmond Daily Dispatch. “Council Agrees to Repair Market.” July 21, 1943.